LONGORIA, JOSEPH EARL [JOEY LONG] (1932–1995). Joey Long, blues guitarist, singer, and songwriter, was born Joseph Earl Longoria in Zwolle, Louisiana, on December 17, 1932, the son of Earlene Leone and Fred Longoria. His parents were of Italian-French and Mexican-French extraction. When Joey was very young the family moved to Merryville, Louisiana, and continued sharecropping during some of the bleakest years of the Great Depression. Along with his parents, six brothers, and one sister, Joey picked cotton, worked on the farm, and lived a hard rural life. When he was four years old he developed polio. The disease left his legs weak and slightly deformed. For a time, until his legs became stronger, Joey's mother had to carry him on her back into the cottonfields. Joey Long performing with his guitar. Image available on the Internet and included in accordance with Title 17 U.S.C. Section 107. Although Earlene played mandolin, young Joey's interest in music came from his friendship with Charlie Wiser, an old black sharecropper who lived down the road from the Longorias. Wiser taught Joey to play guitar, and, after working all one summer saving his money, Joey bought himself a guitar. He also learned to play the harmonica and sometimes sneaked out of the house at night to go out to the pasture and practice his music in the moonlight. Records indicate that he attended school only through the third grade. At sixteen years of age he moved north to live with an uncle and work as a truck driver. By the early 1950s he moved back to Louisiana and started his music career, shortening his name to Joey Long and sometimes calling himself Curly Long. His musical roots were in the kind of country music and black blues he had heard in his youth from Charlie Wiser. The duo of Long and Sonny Fisher was one of the first groups to play rockabilly. In commenting on the rise of rockabilly in the late 1940s and early 1950s, historian Bill C. Malone observed that "[c]ountry music had long demonstrated its affinity for the stepped-up rhythms of black music," and rockabilly was thus a "successful fusion of 'rocking' black music and 'hillbilly' music," played and sung by white performers. KWKH's Louisiana Hayride. Image available on the Internet and included in accordance with Title 17 U.S.C. Section 107. During the 1950s Fisher and Long made appearances on the Louisiana Hayride in Shreveport. 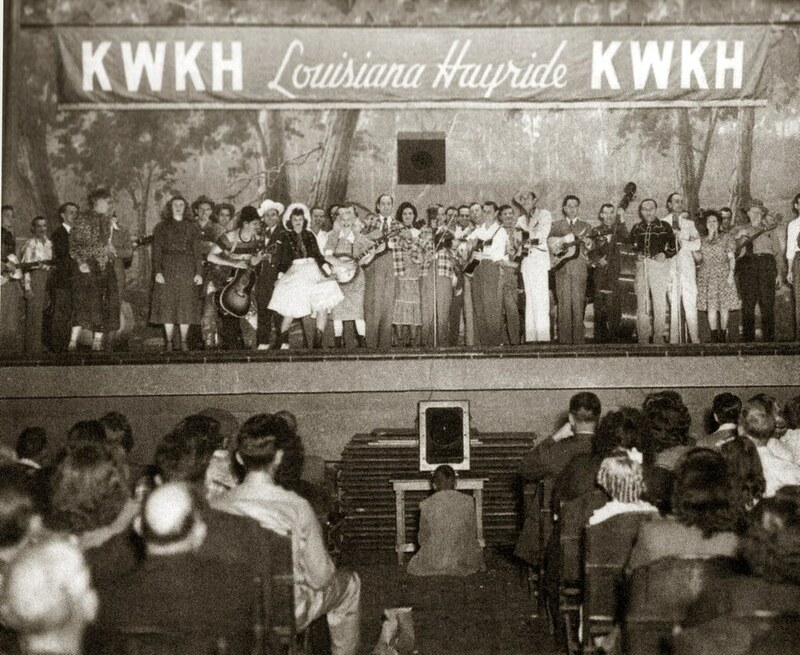 The Hayride, which first aired on radio station KWKH on April 3, 1948, provided "a forum for musical exposure" and served "as a launching ground for future stardom." Musical talents such as Elvis Presley, Webb Pierce, Johnny Cash, George Jones, and Hank Williams started their national touring careers on this program. 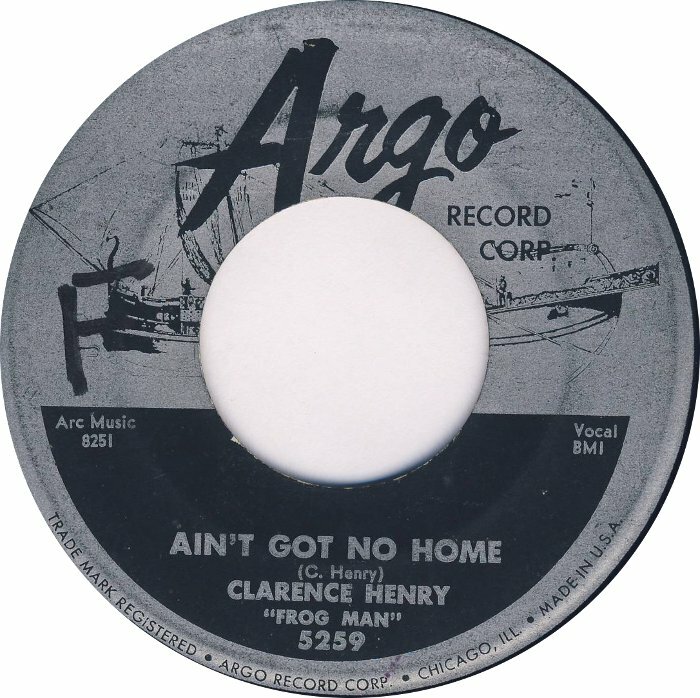 Clarence Henry's Record, "Ain't Got No Home". Image available on the Internet and included in accordance with Title 17 U.S.C. Section 107. Long eventually stopped playing with Fisher. By the mid-1950s he had married and moved his wife and baby son to Houston. He lived the rest of his life in Southeast Texas. The marriage ended in divorce, however, and Long's wife and son returned to Louisiana. At some time before his move to Houston, Long lived in New Orleans and performed with a variety of musicians, including singer Clarence "Frogman" Henry. He played lead guitar on Henry's hit recording of "Ain't Got No Home." Later Long recorded with Ivory Joe Hunter of Beaumont, playing saxophone on "Since I Met You Baby." At one time Long had a recording contract with Houston's legendary rhythm-and-blues producer Huey Meaux. Other Meaux artists included Doug Sahm, Lightnin' Hopkins, T-Bone Walker, Freddy Fender, and Dr. John. Sign for the Cedar Lounge club in Houston. Image available on the Internet and included in accordance with Title 17 U.S.C. Section 107. Long made a living recording and performing in Houston-area clubs such as the Cedar Lounge. He built a solid reputation as a multitalented musician. His authentic, down-home, country blues sound, as well as his unique, flamboyant style, caught the attention of many young white artists who wanted to play the blues. Tary Owens, an Austin musician, folklorist, and record producer, believed that Long was the first non-black blues musician in Texas to play with black blues bands. Early in the 1960s, for example, Duke-Peacock recording artist Big Walter the Thunderbird invited Long to play lead guitar on a new recording since guitarist Albert Collins had left the band shortly before the scheduled recording date. Big Walter's song "Nobody Loves Me" features Long on lead guitar. The Rains Came Album Cover by Joey Long. Image available on the Internet and included in accordance with Title 17 U.S.C. Section 107. Long's discography includes such songs as "Something to Ease My Pain," "The Rains Came," "The Blues Just Walked In," and "If You See My Baby." Long also recorded and performed with numerous other artists, such as Link Davis, Jr., King Ivory, T-Bone Walker, and Ikey Sweat. Sweat, known in Texas as the "King of the Cotton-Eyed Joe," was a close friend and performed with Long, off and on, for nearly twenty years, until Sweat's death in 1990. In 1978 Long released two albums, The Rains Came and Flying High, on the Crazy Cajun label. From the 1950s through the mid-1960s Long married five times and fathered three children. The marriages were short-lived except for his last union, with Barbarella Windham, in 1966. This marriage lasted twenty-nine years, although it produced no children. Barbarella's personal reminiscences about her husband suggest that playing music was the all-consuming focus of Long's life. She has commented that Joey had little interest in managing the business side of his career or in promoting himself outside of Texas. Long went to Europe only one time, to perform at the 1992 Blues Estefete in Utrecht, Netherlands, with band members Gary Dorsey and John Turner. 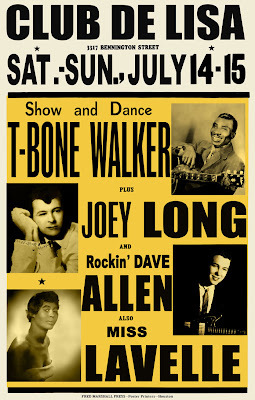 A Concert Poster from the Club de Lisa featuring Joey Long, circa 1964. Image available on the Internet and included in accordance with Title 17 U.S.C. Section 107. Long's involvement in the Texas music scene and his profound influence on a whole generation of Texas musicians is not widely recognized outside of the Houston area. Nevertheless, his playing style had a huge impact on musicians such as Johnny Winter and Billy Gibbons of ZZ Top. John Turner, who has also played with Winter, described Long as the "godfather" of all white blues guitar players from Texas. A mild stroke in the mid-1980s slowed Long down only slightly. Barbarella indicated that her husband refused to stop playing and would not follow the doctor's orders for medications and rest. The lifestyle typical of many musicians––late hours, alcohol, and drugs––no doubt contributed to Long's sudden death from a heart attack and brain hemorrhage on March 22, 1995. He was buried in Houston and survived by his wife and three children. All Music Guide (www.allmusic.com), accessed January 24, 2003. Jimmy Joe Long, "Joey Long" (http://www.webspawner.com/users/joeylong/), accessed October 25, 2011. Rick Koster, Texas Music (New York: St. Martin's Press, 1998). Bill C. Malone, Country Music, U.S.A. (Austin: University of Texas Press, 1968; rev. ed., Austin: University of Texas Press, 1985; 2d rev. ed., Austin: University of Texas Press, 2002). Handbook of Texas Online, Ruth K. Sullivan, "LONGORIA, JOSEPH EARL [JOEY LONG]," accessed April 23, 2019, http://www.tshaonline.org/handbook/online/articles/flo76.